Monica Ross, Like Gold in the Furnace, Tape-slide work, 1987-1988. Photo credit: Bernard G. Mills. British artist Monica Ross died in 2013 leaving an influential 40-year body of pioneering, socially-engaged, feminist and performative art practice that has profound significance for contemporary art and society. This exhibition presents archival material and works from 1970-2013 including early feminist collaborative works, drawings made at Greenham Common in the 1980s, poster designs for the anti-nuclear movement, works relating to the writings of Walter Benjamin and documentation from the 60 performances of Anniversary-an act of memory, solo, collective and multi-lingual recitations from memory of the Universal Declaration of Human Rights (2008-13) which concluded with a final collaborative performance at the UN in Geneva on the day of Ross' death. A monograph on the artist, published by Sternberg, will be launched at the exhibition. Monica Ross (1950-2013) was an artist who worked with video, drawing, installation, text and performance who first came to prominence as a Feminist artist and organiser. Ross was co-responsible for collective initiatives such as the seminal Women’s Postal Art Event (Feministo: Representations of the Artist as Housewife, ICA, London, 1977, Kunstlerinnen International 1877-1977, Schloss Charlottenberg, Berlin, 1977) and the touring project Fenix with Kate Walker and Sue Richardson. Both projects made visible the conditions and constraints of the working class female artist with Fenix (1978-80) making studio practice public by appropriating galleries as workspaces. Fenix was included in the group exhibition Issue, curated by Lucy Lippard and Margaret Harrison at the ICA, London in 1980. Ross then co-established the Sister Seven group which operated as a national network for the distribution of poster art and performances in church halls, libraries, on the streets and at peace camps including Greenham Common. Monica Ross curated exhibitions, published critical essays and text works and was Senior Lecturer in Fine Art at Saint Martins School of Art (now Central Saint Martins), London 1985-1990, later becoming leader of the innovative Critical Fine Art Practice course from 1990 - 1998. Ross was Guest Professor at Institut für Kunst in Kontext, Universität der Künste, Berlin 2004, and an AHRB Research Fellow in Fine Art at the University of Newcastle 2001-2004. In 2008, to mark the 60th anniversary of the Universal Declaration of Human Rights, Ross performed the first of 60 recitations in her series Anniversary – an act of memory: solo, collective and multi-lingual recitations from memory of the Universal Declaration of Human Rights. 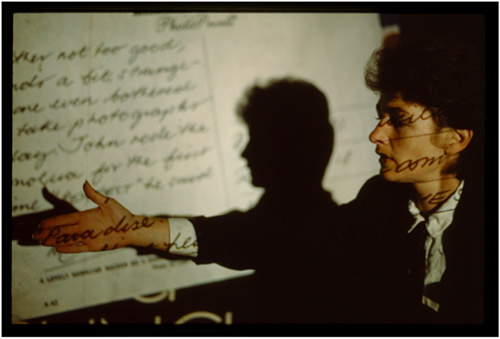 In 2014 the British Library acquired the digital archive of Monica Ross into their collection. The archive documents Monica Ross’s early work from the 1970s through to Anniversary - an act of memory (2008- 2013), a performance series in 60 acts of solo, collective and multilingual recitations from memory of the entire Universal Declaration of Human Rights (UDHR).